I know very little about music, whatever the genre. I do know that it was made for the ear, for the imagination, and for imagining. I also know it was made for the eye in that one needs a firm grasp of the performer, melody maker, and lyricist to understand the depth of a song or composition. Not being a musicologist however, I wouldn’t know how to assess any of these things. When it comes to vocalists whose voices entranced us, hence, I can only say this much: they entranced us because they touched us, and when they touched us, what they sang became timeless. The late Tissa Abeysekara tried valiantly to trace the cultural history of our music. He was fond of our jana gee and hela traditions, for he saw in them the roots which could nourish the artistes in us. That was why, in later years when we embraced the Raghadari tradition and birthed the likes of Amaradeva, he was cautious. For him, the Raghadari Revolution didn’t make sense if through that we let go of some of our finest, most idiosyncratic, and most localised musicians. Through a cruel irony of fate though, that is exactly what happened. We lost Sunil Shantha. We lost Ananda Samarakoon. We lost Piyasiri Wijeratne. We lost a horde of other singers deemed too out of touch in the kind of music that critics, writers, and everyone who wanted to cast in stone his or her two cents on the subject idealised. Many of these singers were derided as Westernised (I’d like to quote Abyesekara’s comment on this: “Whatever that meant!”). Based on certain recommendations drafted by mandarins from elsewhere, Radio Ceylon came up with an arbitrary criterion on what constituted good, local singers. The guitar was out, the sitar was in. Everything derided as Western was condemned, vilified, and thrown out. Just like that. C. T. Fernando was not exactly westernised. But he needed western instruments. As Abeysekara frequently noted, his voice could not open up without the heavy brasswork and strong chords. Limited and chucked away to a corner, he almost languished. And yet, despite the work of some of those pundits who considered the likes of him as too out of touch with the revolution they were bringing about, he nevertheless gave us songs that probably are more remembered than half of what they could have come up with. Singers are like that, I suppose. They survive despite the harshest circumstances. This is a tribute (of sorts) to C. T. Fernando. What was it about the man? His voice? Perhaps. He opened up with honesty, with sincerity. When you listen to him, you get the feeling that he experienced whatever he sang on. He could have been singing of his own child in “Bilinda Nalawa”, or he could have sung of the anguish, the joy, the sorrow of a thousand and one fathers who see and cradle their children for the first time. He could have been a carter when he sang “Bara Bage”, and in fact, long before television and long before the invasion of music videos, he gave the impression of doing what the sang made us think he was doing. 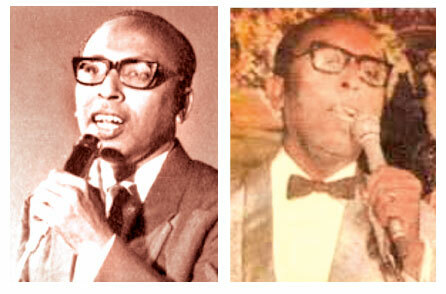 Cyril Tudor Fernando was born on January 28, 1921 in Kadalana, Moratuwa. He was sent for his studies to St Mary’s College in Nawalapitiya. Having been born to a staunch Catholic family in an equally staunch Catholic stronghold, he acquired a love for hymns and sermons and became a choirboy at the parish Church, becoming first in a singing competition there. He followed this up with prizes for oratory, elocution, and drama at St Mary’s, where he honed in on his penchant to speak out and articulate loudly to near-perfection. Because of this, he was able to move into his career fairly early on in life. He became choir master for the ARP Messenger Service from 1942 to 1965. During the war years, he entertained Allied troops when he joined the Colombo Grand Cabaret. A year after the war ended, Radio Ceylon, to which he more or less aspired (given that aspiring vocalists, composers, and lyricists saw in it their baptism of fire), hired the formidable Professor Ratnajunkar. It was the good professor who, according to Tissa Abeysekara, began privileging oriental musicians, but for the time being he was more sensitive to variety. He auditioned Fernando, he saw the man’s potential, and he hired him. It was these songs, I am willing to bet, which got him an audience. They are all plebeian in the strictest sense of that term, and for that reason, they appealed to everyone. The same characteristics that defined his work for the years to come – they were all orchestrated using heavy brassword and chords – continue to enthral us even now. Fernando moreover did not pretend in these songs. In “Ambili Maame”, he was more or less a child asking the titular character as to what he’s doing, and in “Bilinda Nalawa” (as I pointed out earlier) he was a father, older but by no means bereft of a childlike sense of wonderment. He was (if you’d like to put it that way) naive and full of innocence. He couldn’t be C. T. Fernando if he wasn’t. And when Radio Ceylon began a process of musical spring cleaning and firing those derided as outsiders, he didn’t find it hard to regain his voice. He signed on to the Lewis Brown Company where he recorded another bunch of lovable songs, like that immortal tribute to childhood, “Ma Bala Kale.” He collaborated with Tharanga, Silverline, and Sooriya in later years and through the latter, was able to get into its third popular concert, aptly titled “The CT Sooriya Show.” Through all of this, he made use of his definitive signature: the melody. At a time when people were yet to grow used to heavily orientalised melodies with even more heavily orientalised lyrics, the simple, pop, and by no means hard to grasp tunes that adorned Fernando’s songs won crowds and acclaim. He led other lives, this man. He set a precedent by becoming the first local artiste to be featured in a terrain inhabited exclusively by Western musicians, when he was featured in the “Little Hut” at the Mount Lavinia Hotel from 1960 to 1966. After returning from a tour in Europe some years later, he was featured again at another such exclusive spot, at the “Coconut Grove” at the Galle Face Hotel. He became the first Ceylonese singer to perform at the Commonwealth Institute in London. He followed all these triumphs with a hugely successful EP record (titled Sigiri Sukumaliye) with Silverline in 1975. Two years later, on October 21, he died of a heart attack. Musicologists consider the man as a quirk. Perhaps he was. He introduced Western music to the country, though it would take other pioneers to carry on with what he did and help further it. Abeysekara classed him alongside Sunil Shantha, Chitra and P. L. A. Somapala, and B. S. Perera. There’s of course a wide gulf between the hela tradition of the former and the jazzy, folksy tradition of the latter, but between the one and the other there was a similarity that surpassed all other such differences: their penchant for melody, for experimentation, and their love for music as a universal, yet by no means culturally castrated, language. C. T. Fernando belonged to this crowd. Not only did he sing lovingly. He also composed the melodies for practically every song he sang. So yes, he was not merely a performer, fiddler, or vocalist. He was all these things, and more. Much more.